Deck those paws with bells so jolly and jingle all the way through the Gaslamp Quarter for The Vet + Pet West Gaslamp Holiday Pet Parade presented by FOMO Bones. Pet owners and their furry, feathered, and scaled companions are invited to don their favorite costumes for this jolly promenade and Holiday Pet Market on Sunday, December 16, 2018, at MLK Promenade Park, adjacent to the Hilton San Diego Gaslamp Quarter (401 K Street, San Diego, CA 92101). The Pet Parade steps off promptly at 2:00 pm from under the iconic Gaslamp Quarter Archway, and continues up Fifth Avenue takes a left at E street and down Fourth Avenue ending at MLK Promenade Park, where contest winners will be announced and the Holiday Pet Market will continue! Festively-attired critters compete for bragging rights and prizes in fun costume contest categories. Dogs, cats, birds, and even fish are welcome to take part in this holly-jolly good time! Registrants can be sure to grab a goodie bag full of fun samples, toys, coupons, and other gifts for your festive fur friends at the FREE Holiday Pet Market, open to the public from 12PM to 5PM with live music, presentations, and festive fun for all. 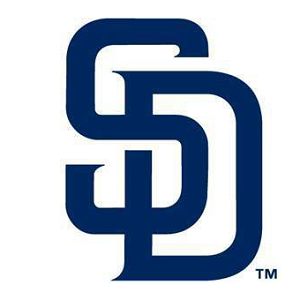 Official viewing stations will be around the Gaslamp Quarter providing patios to view the pets on parade and specials to partake in. The best vantage points for the Pet Parade are along 4th & 5th Avenues between E and K Street from 2PM – 3PM (arrive early to peruse the Holiday Pet Market and guarantee a great spot to watch the parade). *Jolly pets welcome. No livestock allowed in parade. Advanced Registration: $15 per pet | Day-of Registration: $20 per pet | Holiday Pet Market and Parade Viewing are FREE for Spectators! Contest Rules: Each entry is automatically eligible for a chance to win one of our Contest Categories. Winners will be selected and announced at the Pet Parade Awards Ceremony on the stage immediately following the Pet Parade at MLK Promenade Park. Judges’ decision is final. Must visit the judging panel between 12:00PM – 1:30PM to be considered. 3. BEST PET COSTUME – Awarded to the most all-around creative and elaborate pet costume. This award is for costumes of all types, whether it be festive, sports-themed, kooky or scary. 5. 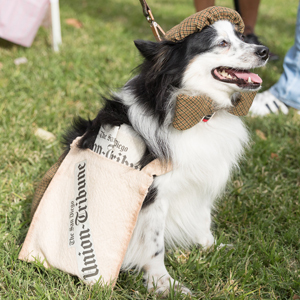 BEST PET HOLIDAY COSTUME – Awarded to the pet donning the most festive costume at the Pet Parade. All costumes are welcome at the Parade, but only those specifically celebrating the holidays are eligible to win this award. 7. BEST COSTUMED GROUP (3 or more) – Awarded to the best costumed group of three or more in the Pet Parade. Get the whole family involved! 8. BEST FLOAT – Awarded to the most creative float that showcases their pet the best. 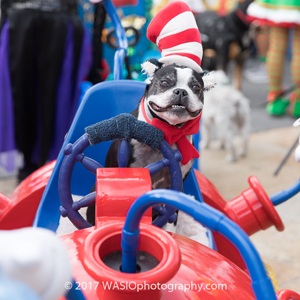 9.BEST IN SHOW – (opportunity to be Grand Marshal at next year’s event) – Awarded to the absolute show-stopping, best costume of the Pet Parade. This award is given to the best of the best, and the winner is invited to join us and lead at next year’s 12th Annual Gaslamp Holiday Pet Parade! GreyFriars Bobby was a Skye Terrier who became known in the 19th century Edinburgh for supposedly spending 14 years guarding the grave of his owner, a service man until he died himself in 1872. San Diego’s sister city Edinburgh, Scotland gave the gift of a bronze statue of Greyfriars Bobby that sits in the historic foundation’s pocket park. Greyfriars Bobby symbolizes Loyalty, Service and Friendship. This year’s recipient of the award will be Ricochet! Surf Dog Ricochet is an internationally renowned, award winning surf dog who has become an inspirational phenomenon, philanthropic role model, internet sensation, fundraising marvel, community advocate, goodwill ambassador, and muse to millions! She has gone from service dog to SURFice dog® and back again! 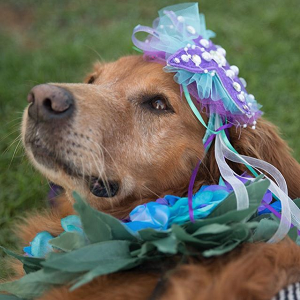 She is also a hero dog, dog of the year and therapy dog who lives a lifestyle of helping others by ‘pawing it forward’ while raising awareness & over $500,000 for human/animal causes. Surf Dog Ricochet advocates for many human interest initiatives including anti-bullying, equality, animals, the disabled community, individuality, crisis situations, accepting others for who they are, adaptive surfing, cancer, childhood cancer and many more. Click here to learn more about Ricochet! Looking for weekend fun that’s family and pet friendly? 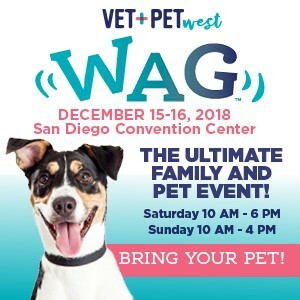 Don’t miss Wag PetCon Saturday and Sunday, December 15 and 16 at the San Diego Convention Center. 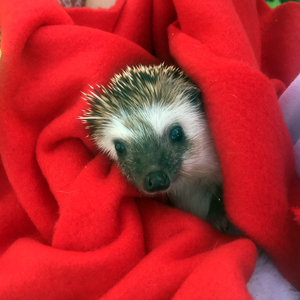 Learn about your pet’s health and enjoy photo booths, a petting zoo, concessions, adoption programs and more! Visit VetandPet.com/wag. 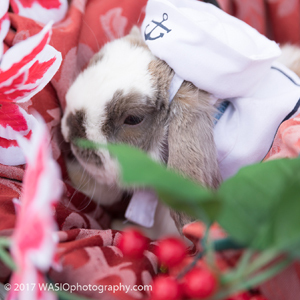 Registrants of our Vet+Pet West Gaslamp Holiday Pet Parade presented by FOMO Bones receive FREE admission to the Wag PetCon! Parking is available at the 6th & K Parkade (289 Sixth Avenue) and Park It On Market (614 Fifth Avenue)!